Imagine a notepad of unlimited pages that’s always available whenever you’re around your MacBook, iPhone, iPod touch, or iPad — that’s the idea behind Notes, and it’s superbly simple! To open the application, click the Notes icon in the Dock. Search box: To hunt for a specific note, click in this box and type a search phrase or name. Folders list: You can create new folders to hold specific kinds of notes. To add a new folder, choose File→New Folder or press cmd+Shift+N, and then type the new folder name. To switch between folders, display the Folders list and click the desired folder. Notes sidebar: Each note you create appears as a separate entry in the sidebar. You can click a note to switch to it immediately. New Note icon: Click this icon to add a new note. You can also right-click the sidebar and choose New Note from the shortcut menu. Notes uses the first line of text that you type as the title of the note, which appears in the sidebar. Show and Hide Folders List icons: You can click these two icons to display or hide the Folders list. Note page: This free-form pane is where you type the body of your note. You can also drag images from a Finder window and include them in the body of the note, and even attach files by dragging them from a Finder window as well. Delete Note icon: Click the Trash icon at the bottom of the Note page to delete the current note. The application will prompt you for confirmation before the deed is done. 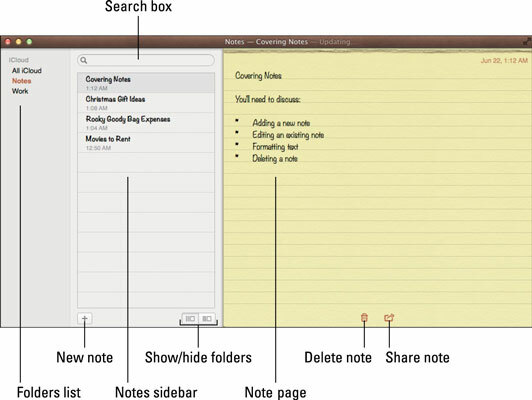 Share Note icon: Open this pop-up menu to share the contents of the current note, just like the Share icon that appears on the Finder window toolbar. Sharing options can include a new e-mail message, a new message in the Messages application, and new postings to Twitter and Facebook. To edit a note, click it to select it in the sidebar, and then simply make your changes or additions in the Note page. Use the Format menu to format the text — everything from different fonts and colors to inserting bulleted and numbered lists.